Everyone loves navy and blue at the moment. But we love the colors and spectrum on the blue palette for their longevity and ease of fitting into nearly any wardrobe. Well edited wardrobes of past and present always had navy and blue staples. The perfectly fitted navy blazer in your closet will never go out of style. Paired with pure white, it’s so elegant. They are crisp, refreshing hues that seem to go with nearly any outfit. Shades of blue are both modern and classic. Ranging from navy to cornflower the colors are a hit with the fashion set and we can see why. Not surprisingly, we love blue handbags. For our original Reid satchel, we chose a navy leather body. It looked sharp and provided a nice contrast with the smooth, glossy black leather. (This black leather is rather amazing. It’s treated with a special tree oil and does not easily scratch. Also, rain drops bead up and roll away quickly in case you are caught in a downpour.) From the moment our navy Queen Street courier satchel hit the website, it was an instant hit. It’s one of those designer handbags that really resonated with our customer and subsequently sold out. There is a wait list, and we hope it will be in stock soon. When designing the smaller Reid satchel, we went with a lighter navy blue. This light navy blue shows off the smaller silhouette. And then for an added pop of color we added a green zipper fabric and leather pull. It’s the perfect combination for the satchels smaller size. Many of our customers love designer handbags in navy because they go with nearly anything yet it’s not the ubiquitous black and/or brown. 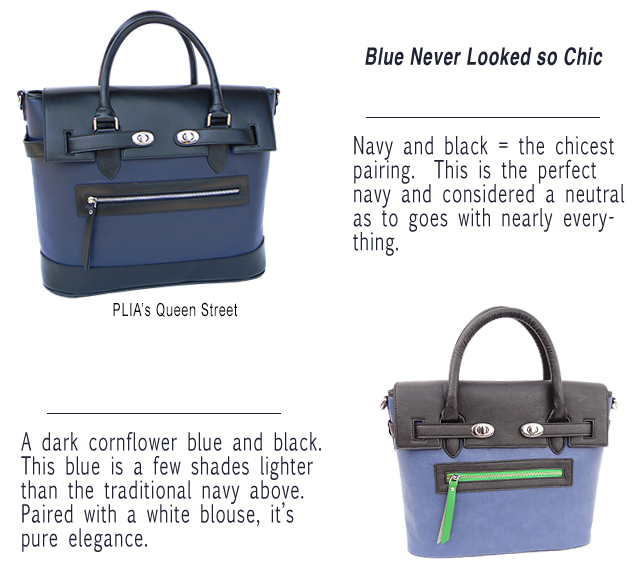 A navy and lighter blue handbag will be well carried and a staple in your wardrobe for many years to come.